Mark Zuckerberg of Facebook and Jack Dorsey, CEO of Twitter, are now the new targets of ISIS supporters, threatening the two that they will fight back against their extensive effort to crack down on social media accounts, deleting groups and pages promoting terrorism. In a 25-minute video titled “Flames of the Supporters”, which is created in response to efforts by Facebook and Twitter to stop terrorist activity on their platforms, is made by an ISIS-supporting hacker group that calls itself “Sons of the Caliphate Army.” The video shows images of Mark Zuckerberg and Jack Dorsey sometimes engulfed in flames, or marked with bullet holes. In a separate slide, the video further stated that ISIS has control on over 10,000 Facebook accounts, 150 Facebook groups, and more than 5,000 Twitter accounts. Existence of the video was first reported by Vocativ and The Sun. In the past year, Dorsey has at least been targeted twice by the ISIS and related terrorist groups. 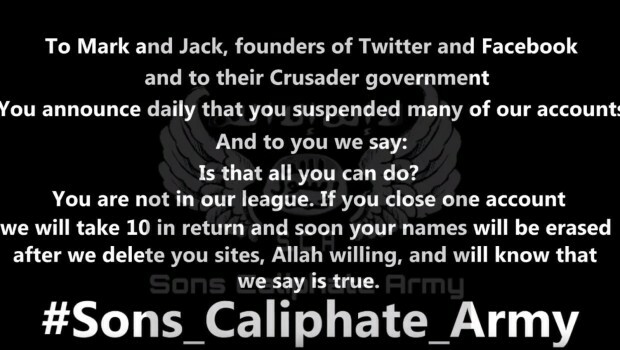 In March of 2015, a group of self-identified ISIS supporters threatened the Twitter founder and CEO for closing hundreds of their social media accounts. Over the past several months, Twitter has closed at least 125,000 accounts tied to the Islamic State, which uses the social network as one of its key media to spread propaganda. It has also grown its team that looks into reports of terror activity on its network. Zuckerberg during his keynote at Mobile World Congress (MWC) this week, echoed his stance and Facebook’s policy on helping to fight terrorism online. Facebook and Twitter have declined to comment on the video. It can be recalled that ISIS has taken a great effort to further spread and strengthen its propaganda online. Back in September, the infamous group has taken its communication systems to Telegram, though the service has taken its time to suspend accounts that spread terrorism. Moreover, it has also sought the use of Tumblr to expand its reach.